NYC, 02/13/2019, 11:15AM. 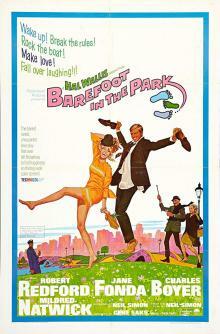 Barefoot in the Park (1967): Comedy based on a play starring Jane Fonda and Robert Redford. Paul, a conservative young lawyer, marries the vivacious Corie. Their highly passionate relationship descends into comical discord in a five-flight New York City walk-up apartment. Starring Robert Redford, Jane Fonda, Mildred Natwick. Barefoot in the Park is based on Neil Simon's 1963 play of the same name. Natwick was nominated for the Academy Award for Best Supporting Actress.